Best on black. Had to go up to Mt. Magazine for a luncheon today so went a bit early to look around. Gloomy rainy day and interesting changes in the color from Saturday morning. 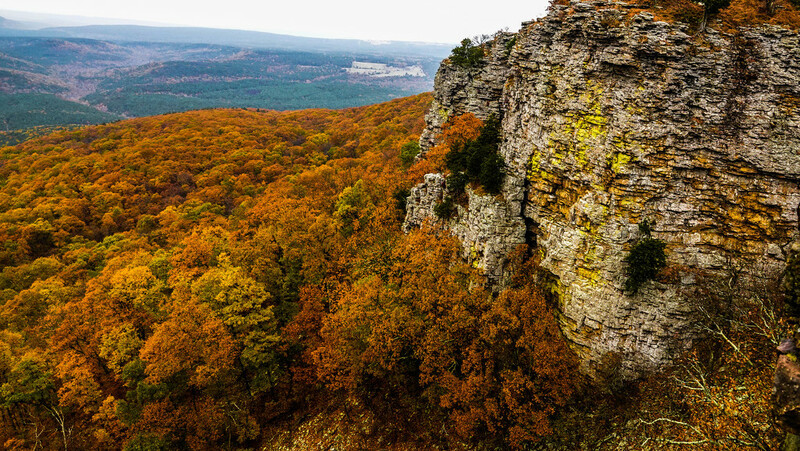 I wonder what brings out the yellow on the rock bluffs? Wow, a whole lot of change. Great capture. A great view and interesting color change from your previous photo. Such a gorgeous spot to take photos. Lovely shot. Is the yellow color a lichen? a wonderful sight and gorgeous colours. Absolutely gorgeous. I was wondering the same thing as @365karly1 - lichen? Lovely colours and beautiful scenery. Beautiful scene. It is amazing how much the color can change after rain or a drop in temperature - and how quickly. @365karly1 @casablanca I'm going to have to see if I can find some more over there in a more "accessible" spot - would think possibly so. This is beautiful! I think the yellow is either some kind of moss or lichen. We don't have any that turn yellow here, but we do have some where the color fades as the lichen dies off.